Walking along Victoria Street, outside the former Cambridge Post Office, in New Zealand, we see a surveyors’ old chain measure. Two brass plaques with an arrow on each – one chain apart. 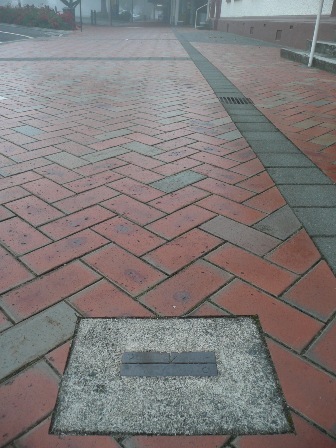 In Queen Street there were two more square brass discs set in concrete. They were similar to the Post Office ones, but without the arrows. One is a chain from the Bryce Street corner, then 5 chain along Queen Street is another one. Perhaps we had two sets? Or were the two with the arrows, now outside the Post Office, originally in Queen Street? They are very similar to the Chain Mark outside the old Government Buildings in Wellington which has a notice to say they were laid down in 1879 to set the Land Survey Standard throughout New Zealand. The New Zealand Historic Places magazine of 1991 says that – ‘Nelson’s five chain test base was laid in 1877 and ran across Albion Square.’ This sounds similar to our Queen Street set. A chain measure at Wanganui is registered as a Category 1 historic place by the NZ Historic Places Trust and I believe there is another in the courtyard of the Provincial Government Buildings in Christchurch.